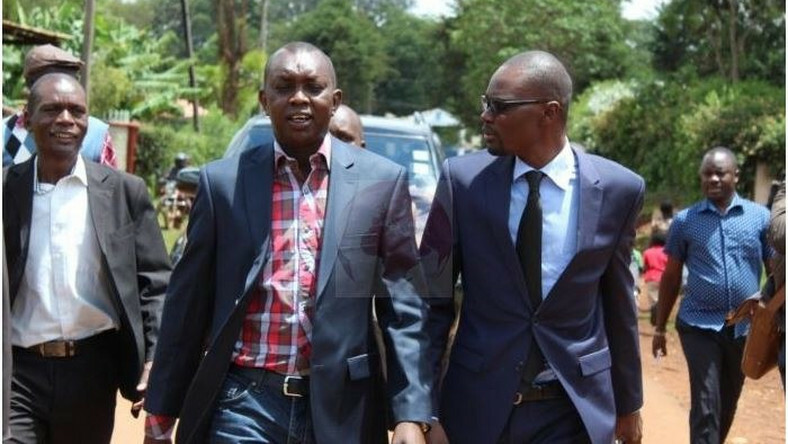 Wednesday April 17, 2019-Kapsaret MP, Oscar Sudi, is facing a battle of titans with his in-laws from Gusii following his vicious attacks targeting Interior Cabinet Secretary, Dr. Fred Matiang'i. In a statement, a section of youth leaders from Nyamira under the stewardship of Brian Mamboleo, poked holes to Sudi's leadership, adding that he's a big letdown to the nation and does not deserve their sister as a wife. "Mr. Sudi seems to be grey on his roles as MP. He has failed to tackle challenges facing farmers only to submerge himself into succession politics. He should spare us with political rhetoric and allow Dr. Matiang'i to do his job," said Brian. "Sudi should now respect his elders or we deal with him. If he claims to be a youth, let him live with our mantra. You cannot sabotage changes initiated by Dr. Matiang'i by carelessly mudslinging his name,” he added. Over the weekend, an irked Sudi dragged Dr. Matiang'i to DP William Ruto's political struggles, accusing the former University of Nairobi lecturer of plotting against Ruto's downfall. Mr. Sudi, a close ally of Dr. Ruto, claimed that Matiang'i is working closely with Interior PS Karanja Kibicho to frustrate politicians allied to the DP. In his argument, Sudi linked the withdrawal of security details attacked to Ruto's ally as part of the scheme.